I wish I could take credit for coming up with this adorable little craft, but I can't. Someone at Michael's (the craft store) did, and it was an in-store make-and-take from a couple weeks ago. 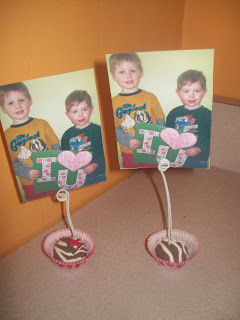 Since I'd signed up to do the class craft at the Valentine's party today, I drug Sam (and a friend, and her son and daughter) to the store to learn how to make them (and, as you might imagine, chaos insued). But the craft was easy, and cute, and when I took it to school for the kids to make, they had a lot of fun with it. 1. 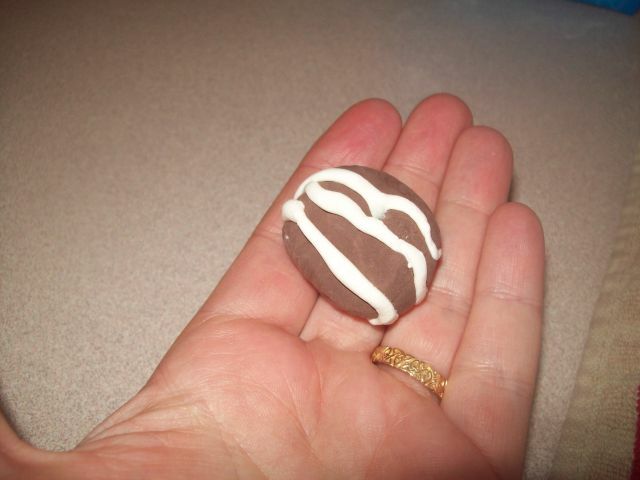 Take brown (or brown and white) modeling clay (we used Crayola--it's nontoxic and air dries) and shape into a truffle/bonbon/candy shape of your choice. You can then embellish with "icing" stripes in white, or little red cherries (see above). 2. 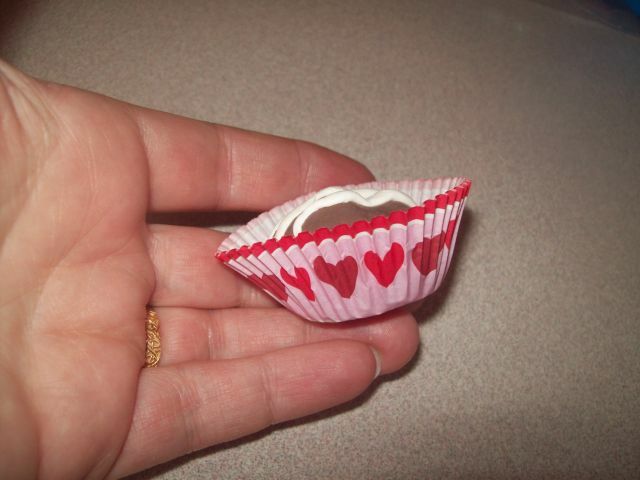 Put "candy" in a mini cupcake wrapper. 3. Take some kind of wire (in the store, they used pipe cleaners... I used cloth wrapped florist wire), and fashion into a loop that will hold a photo. There are different ways of doing this. What worked best for me was putting the wire into a skinny u-shape, and then starting at the bottom of the u, twist the wire around a pair of needle-nosed pliers until I had several loops. 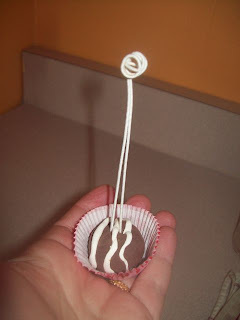 Then I'd clip off the bottom a little with wire cutters so the wire would be more stable when I stuck it in the "candy". 4. 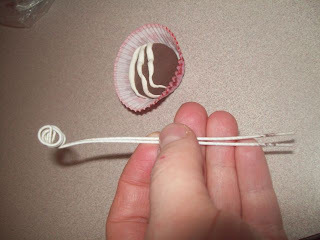 Stick the wire in the "candy". You might have to mush the candy part down a little so that it is stable and will stand up by itself. So cute! 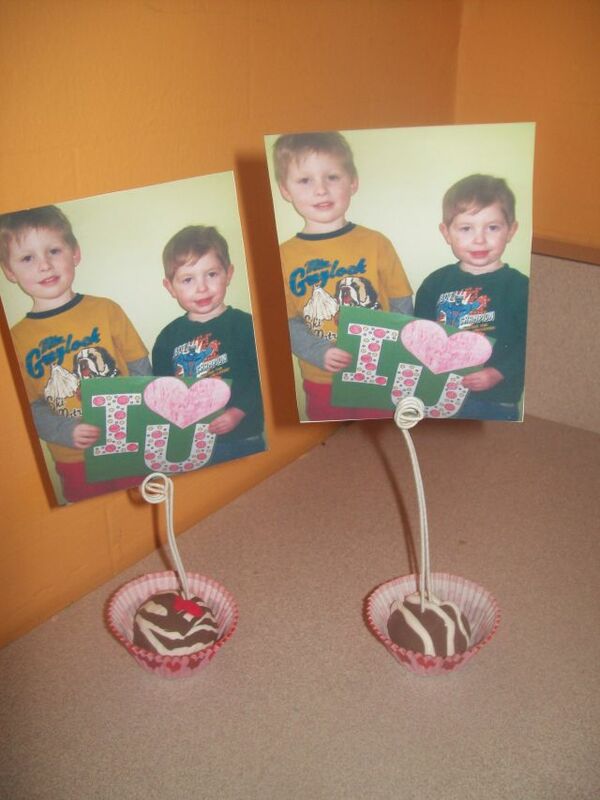 I bet the boys had so much fun making those!